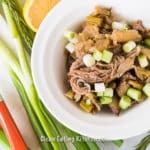 This Slow Cooker Pot Roast is a nourishing meal perfect for Sunday dinner or special occasions. This dish is gluten-free and Whole30 friendly. 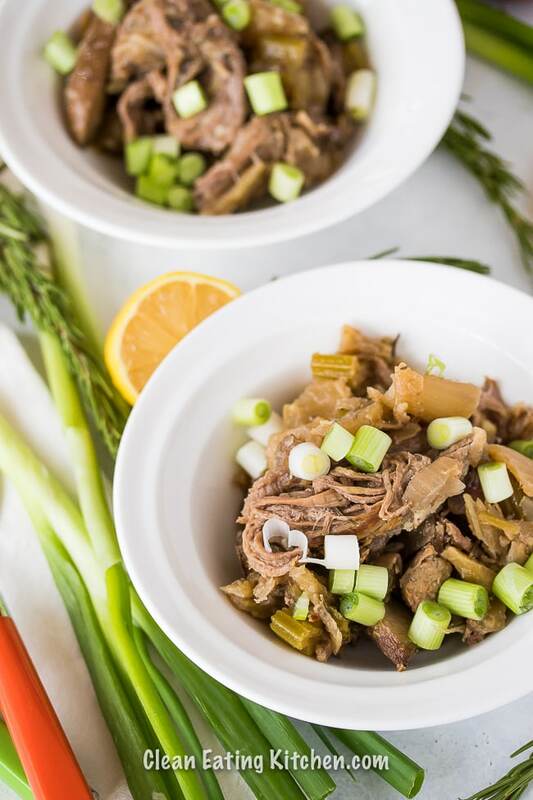 I can’t think of anything more comforting or nourishing that a hearty pot roast using grass-fed, grass-finished beef, and tons of fresh vegetables and potatoes. I’m so happy that I stopped thinking that meat was unhealthy. It is, in fact, full of nutrition and life-giving vitamins. Not to mention, a slow-cooker roast is one of the most delicious meals ever. It is so important to choose organic meat that has been grass-fed and grass-finished. This means that the cows were not fed grains or given hormones or antibiotics. It also means that they lived on a pasture as opposed to a disgusting feedlot. I get almost all of my meat delivered frozen to my doorstep from U.S. Wellness Meats (affiliate link included where I receive a small commission on orders placed using my link). For this special Slow-Cooker Pot Roast, I recommend a two pound Beef Round Roast or a 1.25 pound Tri Tip Roast. You can also use a Chuck Roast, or pretty much any roast you like. The beauty of cooking grass-fed meat in the slow-cooker is that you have hours and hours for the meat to become tender. I’m telling you, this Slow-Cooker Pot Roast is pure heaven. You can feel free to get creative with your pot roast, but I do like and recommend a mix of root veggies and potatoes. I think both add nutrition and heartiness. After all, this is going to be a whole meal in one pot. 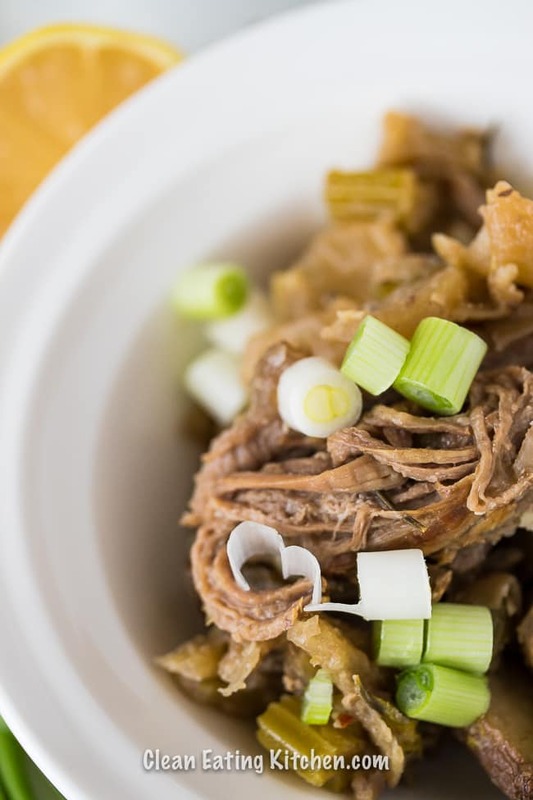 This slow cooker takes all day to cook, so it’s best to get it ready in the morning. By mid-afternoon, your house will smell wonderful and the neighbors will be wondering what time dinner is served, ha ha. The first step is to sear the roast on both sides in a large skillet. This extra initial step will add so much flavor to your roast. It’s worth effort. 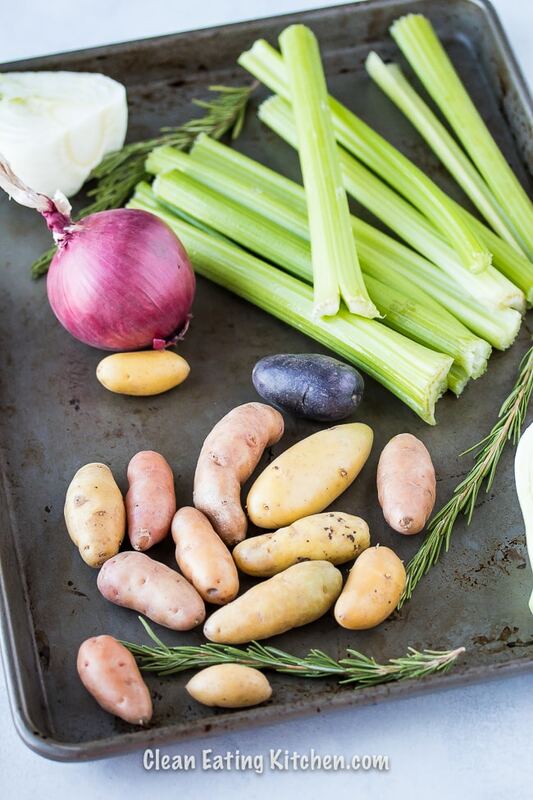 The second step is to chop all your veggies and potatoes and add them to the slow-cooker. I also like to add about 1/2 cup of beef broth just to help get the juices going. The extra broth also prevents burning at the bottom of the slow cooker. Before you pop on the lid, you can add your seasonings, salt and pepper, and some fresh rosemary. All of this flavor is just going to make your pot roast and veggies so mouth-watering amazing. The last step is to put on the lid and set the cooking temperature to low. Set the time between 7-9 hours. When you’re ready to serve, just use a large fork and tongs to shred the meat and then stir it all together. Feel free to serve your pot roast with fresh chopped scallions, if desired. 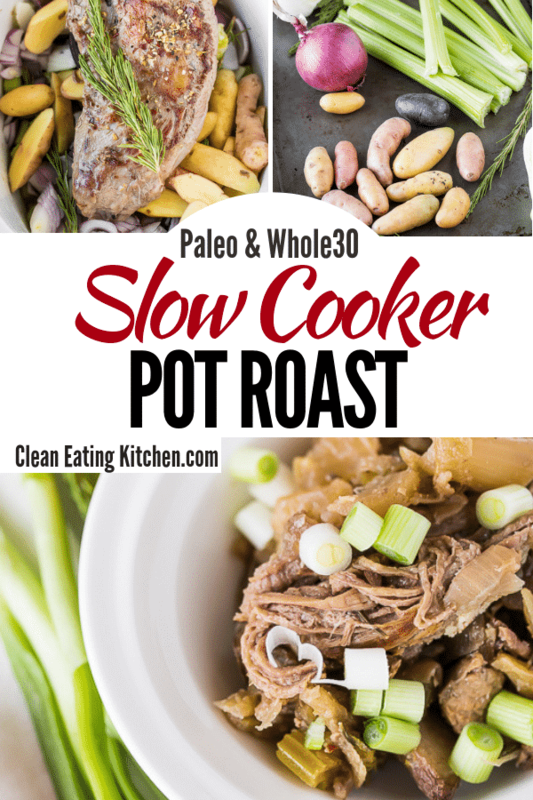 Can I cook this slow cooker pot roast on high? Yes, but the meat will be the most tender if cooked on low. If you cook it on high, set the time to 6 hours or until the meat is cooked through. Can I use red wine in the recipe? Yes, but it won’t be Whole30-compliant then. If you want to use red wine, I would suggest adding it to the skillet after you’ve browned your meat. That way, the alcohol will burn off and you’ll just have the red wine flavor. Can I use a bigger roast? Yes, but I would suggest using more vegetables and potatoes then. Add the roast and use tongs to brown for a few minutes on each side. In the meantime, add the potatoes, celery, carrots, onion, and broth to the base of a large slow-cooker (at least 6 quarts). Use the tongs to move the roast from the skillet to the slow-cooker. Add the rosemary sprigs to the slow-cooker, along with the steak seasoning, salt, and pepper. Place the lid on the slow-cooker and set the temperature to low. Cook for 7-9 hours, or until the meat is tender and easily shreds. When you’re ready to serve, use a fork and tongs to shred the meat in the pot. Stir the meat and vegetables together and serve hot. Top with chopped scallions, if desired. 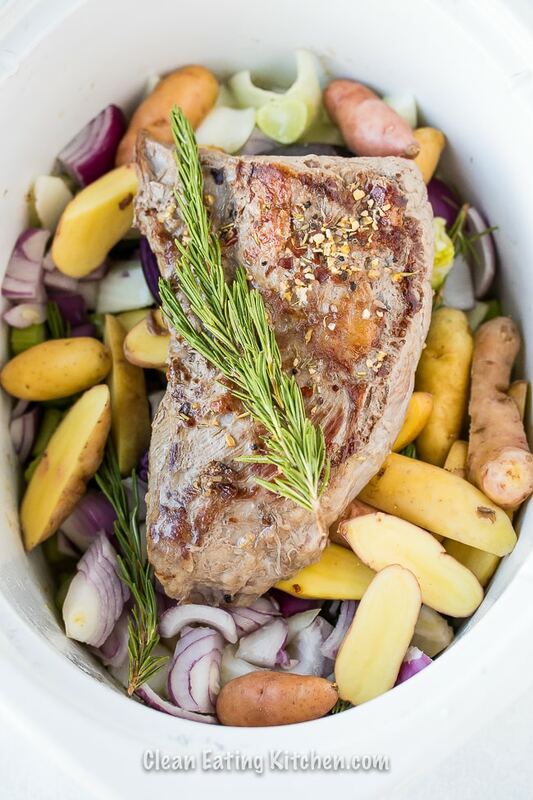 Be sure to pin this Slow Cooker Pot Roast recipe to your favorite Pinterest board! 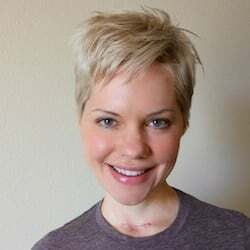 I just got a new slow cooker and it’s cool that I can find a lot of recipes using slow cooker on your site.